Black-tie gala to benefit endangered birds in the Amazon. Gin martinis. Cougars/socialites on the prowl. Then, all of a sudden, a team of ninja bandits descends and you’re forced to defend the honor of your country and your voluptuous European arm candy, and keep the microfiche from getting into the wrong hands. These are the things that keep us up at night. And now we’ve unearthed a secret class at the Sword Class NYC dojo: it’s called Tuxedo Samurai, and you can sign up right now, if you know to ask. This martial arts course requires only two things: 1) that you don only the finest in men’s eveningwear (bow tie optional) and 2) that you have a healthy taste for blood. 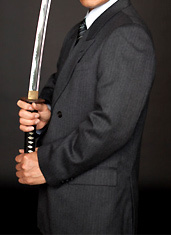 You, and perhaps the rest of the wedding party, can sign up for instruction at Sword Class’s HQ in Midtown, or else have the highly trained and intensely focused instructors come to you bearing very sharp, very real katana blades. After going through some basics, like how to draw your sword without carving open your hand, you’ll move into some basic slice-and-dice maneuvers—meant to dispatch opponents quickly and with minimal risk of ruffling your cummerbund. A good rule of thumb for dealing with cougars as well.